Purim is the Jewish holiday commemorated annually on the 14th day of Adar on the Hebrew calendar. It will fall on our calendar this year on February 24th and, according to tradition, celebrations will commence the evening of the 23rd. The book of Esther details the poignant Purim story of rescue. Haman, an evil advisor of King Xerxes I of Persia, cast lots to set a date when all the Jews of Persia would be killed. 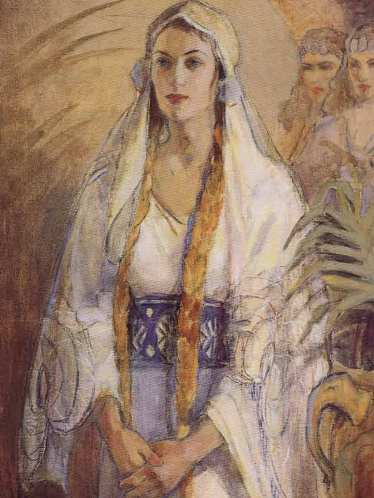 Mordecai discovered his plans and persuaded his adopted daughter, Queen Esther, to go before the king unannounced to plead for the lives of her people. Moved by the young, brave Jewish queen’s plea, the mighty Xerxes rescinded the edict and the plot was foiled. Jewish people around the world honor this day of deliverance with feasting, merriment, and celebration. The walled-city of Jerusalem celebrates Sushan Purim on the 15th day of the month, because fighting continued through the 14th. Hebrew Words: Purim is the plural Hebrew form of the word pur, which means, “lot.” The holiday is called “lots” or Purim referring to the historical narrative about Haman who cast lots to see which day the Jews would be killed in Persia. Ironically, this evil man was impaled upon a pole instead when King Xerxes became aware of his evil plot. Devotional Thought: “Now go, attack the Amalekites and totally destroy all that belongs to them. Do not spare them; put to death men and women, children and infants, cattle and sheep, camels and donkeys” (I Samuel 15:3). A golden thread of protection and preservation of the Jewish people under severe persecution, hardship, or even threats of genocide is woven throughout their history. Turning the pages of time, we see other evil enemies like Haman in past eras: Pharaoh, Epiphanes, Stalin, Chmelnitsky (who conducted pogroms). In modern-days, Adolf Hitler—who stated in a speech in 1944 that if the Nazis were defeated, the Jewish people could celebrate a second triumphant Purim. It is interesting to note that rabbinical interpretation of Purim points back to the curse of the Amalekite shadowed through the action of Haman against the Hebrew nation. The biblical account of Esther calls Haman an Agagite, descending from Agag, King of Amalek. Exodus 17:6 records the first encounter with the Amalekites. Before settling in the Promised Land, the Israelites wandered in the wilderness. During this time, the Amalekites attacked them. This act of arrogance brought ultimate punishment in the form of ignominy—their name would be blotted out forever! “Write this scroll as something to be remembered and make sure that Joshua hears it, because I will completely blot out the memory of Amalek from under heaven…I will be at war with the Amalekites from generation to generation” (Exodus 17:6). This shame is forever memorialized when Moses tells the people of Israel: “Remember what the Amalekites did to you along the way when you came out of Egypt…When the LORD your God gives you rest from all the enemies around you in the land he is giving you to possess as an inheritance, you shall blot out the memory of Amalek from under heaven. Do not forget” (Deuteronomy 25:17, 19). The idea of erasing the memory of the Amalekites, descendant to Haman, was illustrated in different ways through the ages. The Persians and Babylonians burned an effigy of Haman. In Eastern Europe, Jews wrote the name of Haman on the soles of their shoes. When his name was spoken, they would stamp their feet, erasing the writing into the ground. In modern Purim celebrations around the world, you will find the celebrants using noisemakers, cap pistols, whistles, or booing loudly at the mention of Haman’s name. Examples of cursing evil men are scattered through the Torah, the Prophets and the Writings. Machah is the Hebrew verb most associated within the context of being “blotted out.” Machah literally means, “to obliterate” and occurs in Hebrew Scriptures 35 times, often pointing to God who “wipes out” the memory of nations or individuals because of their arrogance and sinful deeds against Him. Interesting that machah is also used to mean, “to blot out” sin. “Have mercy on me, O God, according to your unfailing love; according to your great compassion blot (machah) out my transgressions. Wash away all my iniquity and cleanse me from my sin” (Psalm 51:1). In modern times, we see tyrannical leaders raise their fists and hearts against the Jewish people, threatening their annihilation. For instance, Iran’s Mahmoud Ahmadinejad calls for people of the world to “eliminate the Zionist regime” (or the state of Israel) and denies the historical evidence of the Holocaust. The Jewish people and true believers in Messiah will always have enemies until the second-coming of Messiah, when we crown Him king forever and turn our weapons into plowing instruments. As Messianic disciples of Yeshua, we know that sin and death are the ultimate evil enemies of our souls. We “fight not against flesh and blood but principalities and powers in high places” (Ephesians 6:12). There are the sins of the flesh that tear away at our hearts daily, and there is always a battle raging for our affections and allegiance. Messiah won the war, but we must work out our own salvation. When I was a young woman, I was constantly brought down by depression until that particular enemy of my soul was finally conquered by the blood of Yeshua through deliverance and the light and strength of God’s Word in my life. Honestly, that memory is a vague recollection. Now I can imagine the enemy named “depression” written on the soles of my shoes, and its memory from my life eradicated—stamped into the ground, by the victory and power of the cross of my Messiah. I praise Him daily for what He has done for me! There are many lessons to learn from the poignant story of the brave, young Jewish woman who came against the spirit of Amalekite in the person of Haman. This triumphant truth remains: The true enemies of our lives have been vanquished forever because of our Savior. The day is coming when Yeshua will subdue every enemy of the Jewish people and the Church that is bought with His precious blood, and their memory will be forgotten—obliterated forever. And He will save our souls from destruction. We will rise to be with Him in heaven for eternity. Prayer: I thank you Redeemer and Savior that you have paid the ultimate price to blot out the enemy of my soul, sin and death, by the shedding of your blood on Calvary. May the memory of my sins and enemies be written on the soles of my shoes and ground into dust. They have brought me low in the past, but may they be obliterated from my life forever by Your lovingkindness, forgiveness, and mercy. Purim Celebrations and Traditions: Purim is one of the most festive Jewish celebrations on the Hebrew calendar. Both children and adults dress in masquerade to demonstrate the “unseen” presence of God in the story of Esther and throughout Jewish history. He is always in the background drawing people to Himself. Often children put on a Purim play and recount the story with modern, humorous twists. When the book of Esther is read, noisemakers are sounded to blot out the name of Haman. Hamantaschen or Oznai-Haman is baked, a special poppy seed, sweet pastry. Families attend parties, parties, parties; and in Jerusalem, they dress in costume and party for two days instead of one, remembering Sushan Purim. Thank you Bonnie ,I love this insightful explanation of Purim.